By Maja Black, Sarah Goodman & the Minnesota Environments Team. From the 1970s onward, acid rain started to gain national and international attention as a threat to the environment. A direct result of human air pollution, acid rain occurs when large amounts of fossil fuels with high sulfur content, like coal, release sulfur dioxide and nitrogen oxides into the air. Once exposed to elements in the atmosphere, these oxides then undergo chemical transformations into acids, which, when deposited upon land or water, have damaging effects on the local ecosystems. 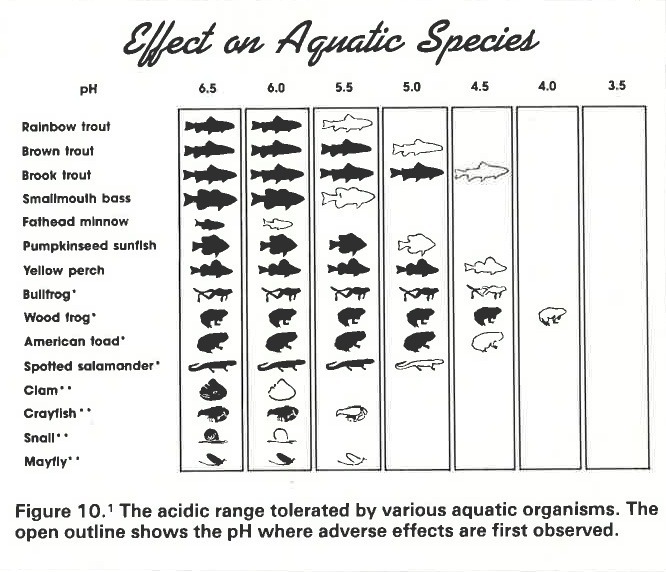 For example, acid precipitation lowers the pH of aquatic systems, which endangers the aquatic life. 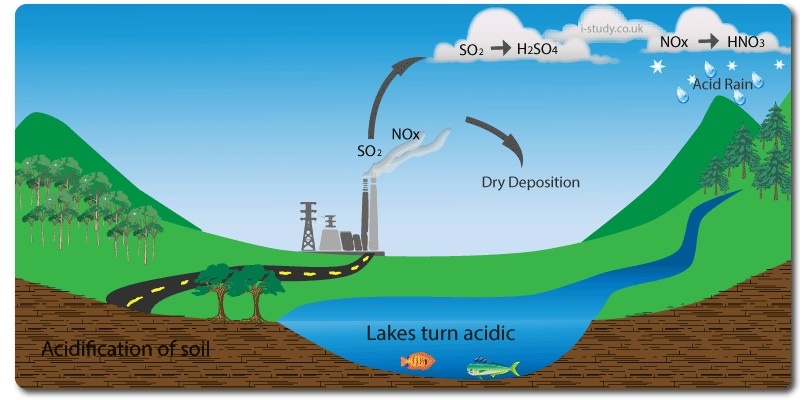 Unlike many localized environmental problems, the effects of acid rain are widespread and not confined to the areas in which the sulfur dioxides originated. Studies in Scandinavia determined that winds from Great Britain and continental Europe were carrying pollutants to Norway and Sweden, acidifying their lakes and streams. This same phenomenon was occurring in North America: heavy fossil fuel burning in places like Texas made toxic waste products airborne, and cross-country winds carried and deposited these pollutants in states as far away as Minnesota. This was an example of an environmental problem that could not be solved by local action alone and, in fact, implicated human environmental activity on a broader scale. 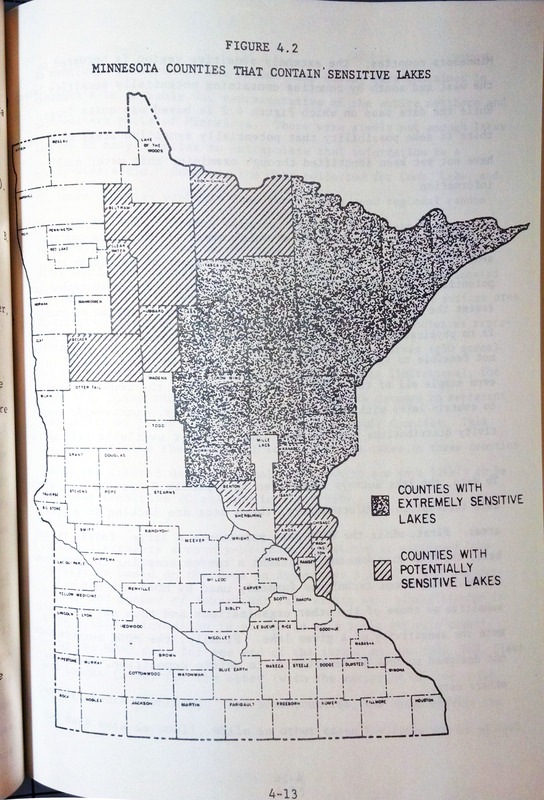 In Minnesota, the threat of acid rain registered on multiple levels. First, Northeastern Minnesota’s biome is particularly susceptible to the effects of acid rain. Furthermore, this large area of the state was sensitive to the effects of acidification both culturally and economically. Symbolically, the Minnesotan identity is closely tied to its label as the “land of 10,000 lakes." This image, however, is one of clean waters and healthy ecosystems. As such, acid rain posed a threat to the state identity. Not only that, but the lakes also serve as important economic and social resources. As one of the largest industries in the state, tourism depends upon the health and wellbeing of the fishing, hunting, and camping environment. 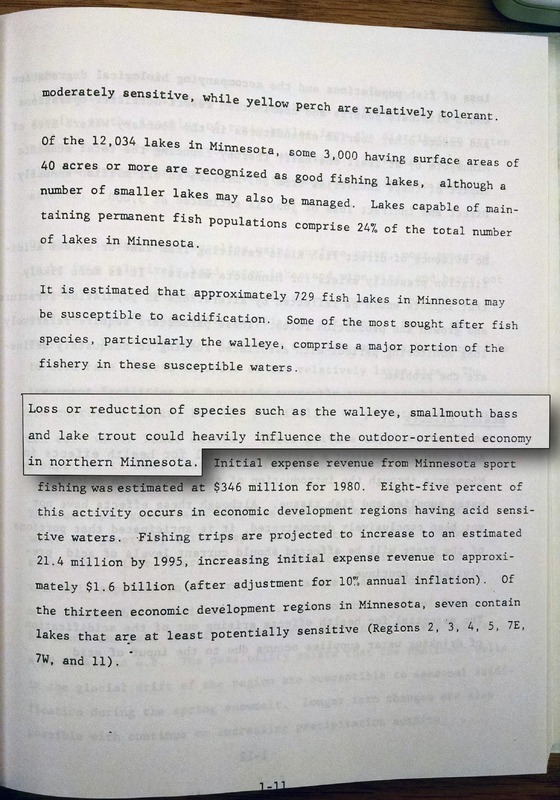 It was obvious that the effects of acid rain would not just impact the environment -- it had the potential to threaten Minnesota’s culture, identity, and industry statewide. Maja Black, Sarah Goodman, and the Minnesota Environments Team., “The Threat,” Minnesota Environments, accessed April 26, 2019, http://mnenvironments.carleton.edu/items/show/12. On acid rain in Minnesota, see Marjorie Borchard, Acid Rain in Minnesota (St. Paul: The Acid Rain Foundation, in cooperation with MN Department of Education, MN Department of Health, MN Department of Natural Resources, and MN Pollution Control Agency, 1987-1988); Gregory Pratt, "Dissecting a Nation-Leading Legacy: The Minnesota Acid Rain Story," in Two Cities, One Hinterland: An Environmental History of the Twin Cities and Greater Minnesota, eds. George Vrtis and Christopher W. Wells (Book manuscript in progress, 2014).